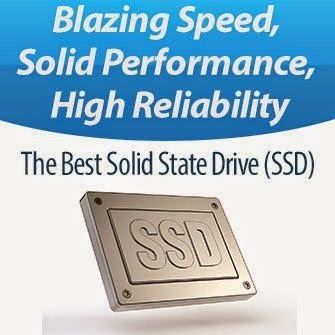 After verifying the great advantages of solid-state drives (SSD), there has been a huge trend among computer users toward obtaining this superb flash-based drive to configure their computers with. Some users who have the affordability would solely depend on this blazing speed drive for all their tasks, including storage and backups, whereas the majority prefer to get an SSD for their primary operating system and favorite software applications, while keeping the rest of their files stored in their old traditional hard drive after making it a secondary storage subsystem, while their new SSD is the primary one. This article illustrates why hard disk drives are indispensable and why you have to use one alongside with an SSD if you need an ideal computer system. Explaining the difference between the storage and system memory in a computer in details is hard and complicated, but we can try though to simplify this matter and provide a basic and plain explanation. In a nutshell, storage is where the information (such as Word documents, photos, movie clips, programs, and so on) is stored. In a computer, the whole operating system itself, such as Windows 7 or Mac OS, is also stored on the internal storage device. Storage is nonvolatile, meaning that the information is still there when the host device (a computer, for example) is turned off and becomes ready again when the device is turned back on. It’s like a book or a paper notebook that’s always there, ready for you to read or write on. System memory, on the other hand, is where information is being processed and manipulated. Data in the system memory is volatile, meaning when the computer is turned off, it’s gone; the memory becomes blank as if nothing had been there before. It’s somewhat like the short-term memory part of your brain, where images or ideas are being formed and processed when you read a book–those that disappear the moment you stop reading. There’s a strong relationship between system memory and storage. The Word document that you’re working on, for example, is in the computer’s memory. When you save it, a copy of it now resides on the computer’s storage (the hard drive). When you close Microsoft Word completely, the document now only resides on the hard drive (storage) and no longer in the memory, until you open it again. All this means, you generally never experience storage. Everything, including the operating system, that’s presented to you on a computer’s screen or via the speakers actually take place in the system memory. Before it gets there, however, it needs to be loaded from the computer’s storage device into the system memory. So the larger and faster system memory the computer is equipped with, the more quickly the information becomes ready and the more you can do with a computer at a time (multitasking). Of course, memory is just one of many factors that decide a computer’s performance. Another factor is the storage itself, which mostly likely is either a hard drive (aka, hard disk) or a solid-state drive. A modern hard drive is very different from earlier generations, which dated back to the late 1950s. However, essentially, the basics remain the same. It’s a box that contains a few magnetic disks (known as platters) attached to a spindle, very similar to a spindle of blank CDs or DVDs. Each of the platters has a reading/writing head hovering on top. As the spindle spins, the head moves in and out to write or read data to and from any part of the platter, on tiny information-recording unit called “data track.” This type of access to information is called “random access,” as opposed to the inefficient “sequential access” found in the old and obsolete types of storage, such as tape. While the concept is rather simple, the inside of a modern hard drive is a world of advanced nanotechnology. This is because as hard drives’ storage capacities increase while their physical sizes remain the same, the density of information written on the platters becomes so great that if we use measurement units, such as foot or inch, to talk about certain parts of a hard drive, we’ll have to deal with decimal numbers of unimaginable proportions. Instead, we need to use nanometers. One nanometer equals 1 billionth of a meter (a meter is about 3.3 feet for those of you in the nonmetric countries). You have to know that inside a regular 2.5-inch laptop hard drive, the Western Digital WD7500BPKX laptop hard drive, for example, the gap between the head and the platter is just a few nanometers. The two can never touch each other–or else the drive will be “bricked”–and note that when a hard drive is at work, its platters spins at 5,400rpm. Desktop and high-end laptop hard drives spin even faster at 7,200rpm or 10,000rpm. To put this in context, if we enlarged the Western Digital WD7500BPKX laptop hard drive by 13,000 times, the platter would look like a circular race track about 3.3 miles in diameter; a data track would be about 0.4 inch in length, and the head would be about the size of a go-cart. When the hard drive is in operation, this go-cart would be flying on the track less than the thickness of a human hair above it, at the speed of some 3.4 million miles per hour. It’s just amazing how hard drives don’t crash every day. Most of them actually last for about five years of continuous usage. An SSD, on the other hand, has no moving parts. Similar to system memory, SSDs are microchips designed to store information. However, these are nonvolatile memory chips that can retain information the way hard drives do. On the outside, a standard SSD looks just like a regular 2.5-inch hard drive and it also works in any applications where hard drives are used. The fact that it has no moving parts means that an SSD is much more efficient in terms of energy usage, more durable, quiet, and much faster than a hard drive. In laboratory testing, the SATA 3 Seagate Barracuda XT, one of the fastest consumer-grade hard drives, offered real-world copy speeds of around 115MBps or little more, while the OCZ Vertex 3, which is considered now an old-fashioned SSD, easily offers around 260MBps. For this reason, a computer that uses an SSD as the main storage device boots and shuts down very fast and can resume from sleep mode instantly. Software applications, including heavy ones like a 3D game or video-editing application, also take significantly less time to start and operate, compared with when the computer uses a hard drive as the main storage. There’s a big catch, however: SSDs are currently much more expensive than a regular hard drive of the same capacity, disproportionately more expensive than they are faster. The Crucial MX100 256GB SSD, for example, costs around $105, whereas the 1TB Western Digital Desktop Hard Drive Black, one of the best desktop hard drives, costs just around $75. As for laptop hard drives, the price of HGST Travelstar 1TB laptop hard drive, which is one of the best hard drive for laptop computers, costs around $75 too. On top of that, SSDs are very limited in terms of storage space, with the top drives capping at around 1000GB [For example: Samsung SSD 850 Evo 1TB] (these cost close to $500, by the way). Using an SSD as the primary storage device for a computer increases the system's performance a great deal. Now you probably don’t want to spend almost $500 on a 1TB SSD. However, spending around $250 for a 500GB SSD might make the most economical upgrade in many cases. This is because it can easily be the single component in your computer that most significantly increases the system’s overall performance. If you run Windows 7, take a look at the Windows Experience Index: more often than not, you’ll see that the subscore of either the graphics card or the hard disk is the lowest and the one that determines the base-score of the computer. While the graphics card’s power is mostly an issue when you play 3D games–meaning it makes almost no difference in general usage, such as Web surfing, video playback, word processing, and so on–the hard drive’s performance affects almost all aspects of a computer’s performance, from starting up, shutting down, application loading, and file editing. Basically any computing operations that require accessing the storage will be affected by the hard drive. This means that when a fast Core i7-based computer is equipped with a regular hard drive, the hard drive will bottleneck the machine’s performance. Most of the time this gap is very large: a fast Core i 7 processor will have a subscore of 7.9, whereas the fastest hard drive will have a subscore of 5.9 in the Windows Experience Index. Now the best way to get the most out of a computer is to have its components offer similar levels of performance. This way you know that you don’t overspend on expensive parts just to have them bogged down by other slower ones. In other words, it’s better to upgrade your current Core 2 Duo or Core 2 Quad computer to an SSD than getting a new computer that supports the new Core i architecture. The latter would likely cost more than $500, not to mention the time you have to spend setting up the new computer, moving data over, and so on. Note that while most SSDs come in the 2.5-inch design (for laptops), some of them, such as the Vertex 3, include a drive bay converter to fit in a desktop computer. You can also buy these converters separately or even get away with having the SSD hanging inside the chassis, as it has no moving parts and is very light. In laboratory testing, an SSD would bring the subscore of hard drive within the Windows Experience Index to 7.0 or higher. In a system that supports SATA 3 (6Gbps), an SATA 3 SSD would bring this up to even 7.8 or 7.9, which is currently the highest for Windows 7. And in real-world usage, replacing your current computer’s main hard drive with an SSD indeed makes the computer’s overall performance much better. The upgrade process is actually very fast, using disk-cloning software such as Acronis True Image. This is the kind of change that once you’ve got it, you’ll never want to go back. Though SSDs are very fast, when it comes to storage, capacity is very important. With the proliferation of user-generated content–photos, music, videos, recorded TV shows–it seems we never have enough storage space. This is the area where SSDs can hardly, if at all, compete with hard drives. For a laptop computer, 240GB might be enough, but for a desktop, that can hardly hold a person’s entire digital library. This is when you still want to use a hard drive as a secondary storage device to increase storage space. The good news is that most of the read-only content doesn’t require fast performance for playing back, and hard drives, though significantly slower than SSDs, are more than fast enough to host them. Other network storage solutions, such as NAS servers, don’t require superfast storage devices, either, mostly because their throughput performance is determined by the network connection speed, which currently caps at 1,000Mbps (around 100MBps). External hard drives also depend on the speed of the peripheral ports, and 100MBps is also currently the cap speed of USB 3.0. For this reason, most of the longterm and high-capacity storage solutions still use hard drives and will still use them for a long time. Those of you who have just decided to upgrade the computer’s main hard drive to an SSD might want to keep the old hard drive as the secondary drive in the computer, at least for backup purposes. After all, it still holds a copy of your entire system.